Synthetic slate shingles are a modern improvement on a construction classic. Made from combinations of plastic and rubber, synthetic slate is designed to mirror the beauty and uniqueness of authentic slate without the expense or installation headaches. Inexpensive– One of the most prevalent benefits that synthetic slate offers is its cost effectiveness. As opposed to authentic slate tiles quarried and cut from real stone, synthetic variants typically cost much less while maintaining several qualities like that of natural slate. Eco-friendly– More and more contractors, including established roofers in Sunnyvale, are pushing for more environment-friendly materials to be used in roofing installations. 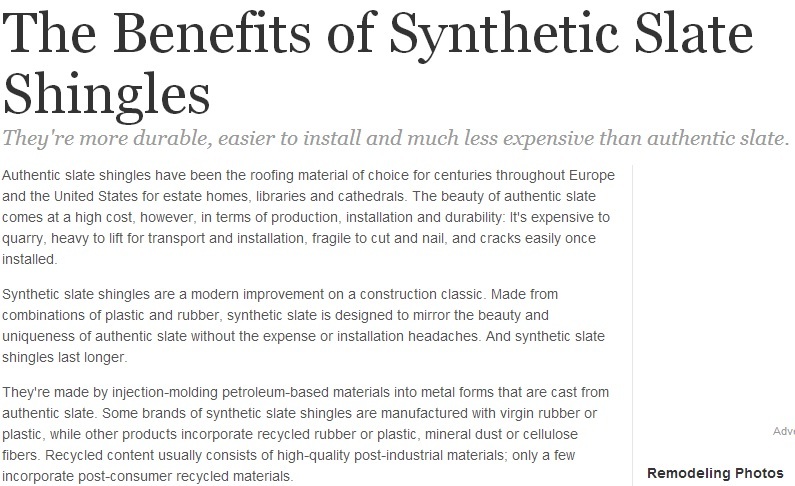 Homeowners looking for a “greener” option have a great catch in synthetic slate roofs, as the materials used in manufacturing synthetic slate are highly recyclable. This can eventually eliminate the concern of natural roofing materials being put to waste after only one use. Weight– Authentic slate tiles are already heavy in multiples of ten, and extremely heavy if hundreds of them are to cover up an entire roof space. Owners of older homes might have a problem with trying to install authentic slate as the weaker beams likely won’t hold under the weight. With the lighter materials present in synthetic slate, weight issues are all but over; installation will be much easier, and transporting hundreds of them can go without a hitch. Wide array of color options– Real slate come in limited color options, and some hues are extremely rare. With synthetic slate, homeowners can choose virtually whatever color they like. This allows for a greater design freedom, especially for those keen on aesthetics. Durability– Synthetic slate is just about as tough as its natural counterpart, and in some situations, even tougher. For instance, authentic slate isn’t known to stand up well against heat ranging from sources like sunlight to even fires. Synthetic slate is virtually fire-proof, and numerous studies have been able to prove it.